Ever since the days of George Formby and Frank Randle, Manchester comedians have been making the country laugh. Why so many, if not most, of the country's top comedians have come from the region is a question many have tried to explain. On these pages we celebrate the comic legends and tv series to have emerged from the comedy capital - Manchester, England! 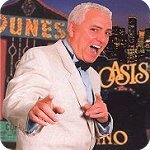 Bolton comedian Dave Spikey (a.k.a. 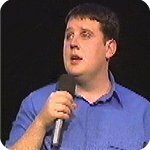 Jerry 'The Saint' St.Clair from Phoenix Nights) spoke exlusively to Pride Of Manchester during his 'Overnight Success' Tour about playing 3 sell-out nights at The Lowry, his new DVD, and working with Peter Kay. He also found time to praise the legend that is Mancunian sports commentator, Stuart Hall.